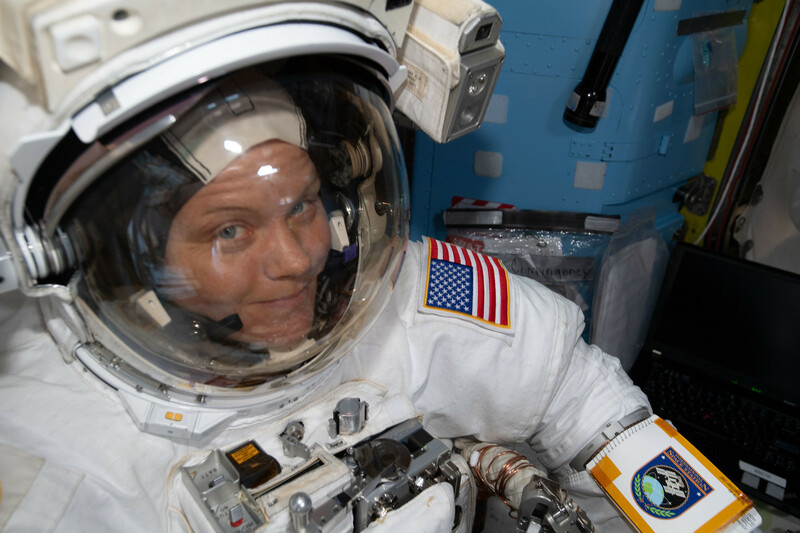 NASA astronaut Anne McClain is suited up in the U.S. Quest airlock preparing to begin what would be a six-and-a-half hour spacewalk on April 8, 2019. The Expedition 59 crew is now training to capture a U.S. cargo ship when it arrives at the International Space Station next week. The orbital lab residents are also busy researching how living in space affects the human mind and body. Fresh off their spacewalk Monday, astronauts Anne McClain and David Saint-Jacques are now practicing to capture Northrop Grumman’s Cygnus space freighter with the Canadarm2 robotic arm. McClain will be at the robotics workstation in the cupola April 19 and command the Canadarm2 to capture Cygnus around 5:30 a.m. EDT. Saint-Jacques will back her up while Flight Engineer Nick Hague monitors Cygnus’ systems during its approach and rendezvous. The commercial cargo craft is due to launch April 17 at 4:46 p.m. from Wallops Flight Facility in Virginia. Hague started his day with more brain research in the Japanese Kibo lab module. The NASA astronaut used a Doppler device to record his arterial blood flow waveforms. The data will help doctors understand how the brain regulates blood flow in microgravity. The astronauts also researched how the station’s atmosphere affects breathing. The experiment studies how dust, particles and exhaled breath inflames a crewmember’s airways. Observations may reveal conditions that exacerbate or alleviate airway inflammation influencing future space missions. SpaceX has announced April 26 as the launch date for its next Dragon cargo mission. The private space freighter will blast off from Cape Canaveral in Florida arriving at the station April 28. This time Saint-Jacques will lead the robotics capture activities while Hague backs him up. 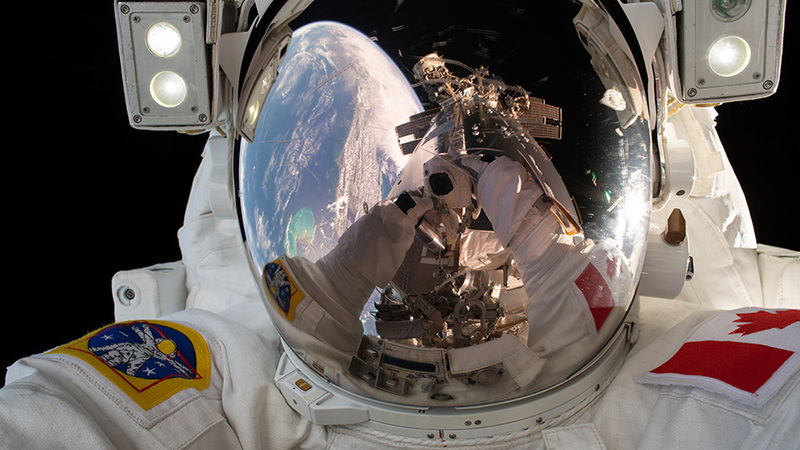 Expedition 59 Flight Engineer David Saint-Jacques of the Canadian Space Agency takes a quick self portrait during a spacewalk while working outside the International Space Station. The Expedition 59 crew has switched focus from Monday’s spacewalk to microgravity science aboard the International Space Station. Soon, the orbital residents will be unpacking a pair of U.S. space freighters. 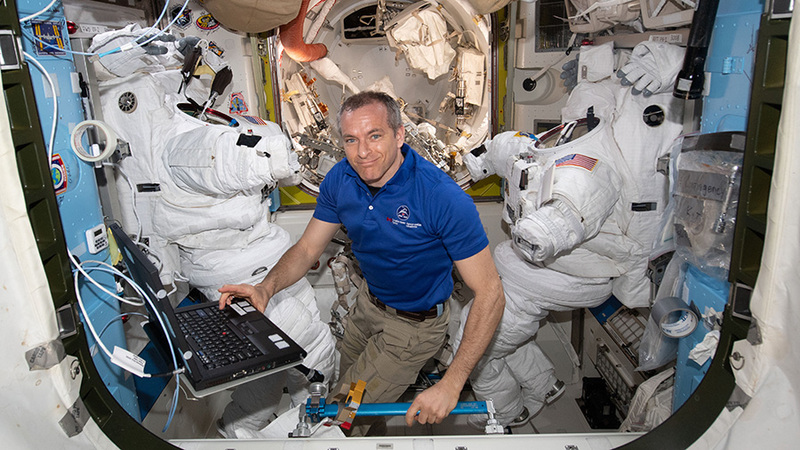 Astronauts Anne McClain of NASA and David Saint-Jacques of the Canadian Space Agency are conducting their post-spacewalk medical checkups today. The astronauts measured their temperature, blood pressure, respiration and ear condition. After the checkups, the spacewalkers had their eyes scanned with an ultrasound device by Flight Engineer Nick Hague. The spacewalking duo along with NASA astronaut Christina Koch also had an hour-long video debrief session with specialists on the ground. The crew and mission controllers discussed lessons they learned that could inform the planning of future spacewalks. 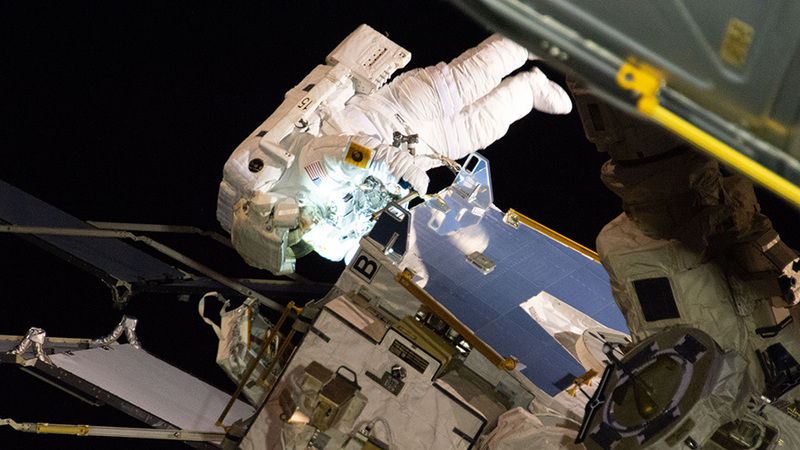 Koch spent most of her day on maintenance replacing science hardware inside the Combustion Integrated Rack. The research device enables safe investigations of microgravity’s impacts on solid and gaseous fuel combustion aboard the orbital lab. Hague explored how blood flows to the brain for the Cerebral Autoregulation study. The brain research uses Doppler technology that measures blood flow waveforms to help doctors understand and treat space-caused lightheadedness. With the recent series of spacewalks now complete, the crew will soon be turning its attention to the arrival of two resupply ships. Northrop Grumman’s Cygnus cargo craft and the SpaceX Dragon will each deliver science and supplies before the end of the month to replenish the space station crew. Cygnus is due to blast off for a three-month mission attached to the station’s Unity module April 17. Dragon is targeted to liftoff at the end of April for a month-long stay at the Harmony module. This Monday, the Expedition 58 crew is taking a well-deserved break after a busy week prior wrapping up SpaceX’s inaugural flight of Crew Dragon to the International Space Station during Demonstration Mission-1, an uncrewed flight test. The vehicle departed station for a splashdown off the Florida Space Coast at 8:45 a.m. EST Friday, bringing NASA even closer to sending astronauts into space from American soil. The Expedition 59 crew, which will soon get their turn in orbit, is taking time to relax and review their launch day flight plan at the Baikonur Cosmodrome in Kazakhstan. On March 14, Commander Alexey Ovchinin and Flight Engineers Nick Hague and Christina Koch are set to blastoff at 3:14 p.m. EDT and dock less than six hours later to the Rassvet module at the orbiting laboratory. Research investigations will get a boost in productivity with their arrival, which will bring the full crew complement to six. All launch and docking events will be carried live on NASA TV. Tomorrow, the Soyuz MS-12 that will carry the new crew crawls to the launch pad at Baikonur as Expedition 58 resumes science studies. On behalf of the Expedition 58 crew, NASA Astronaut Anne McClain takes time to congratulate the NASA and SpaceX teams immediately following the Crew Dragon spacecraft’s undocking from the International Space Station at 2:32 a.m. EST Friday, March 8. 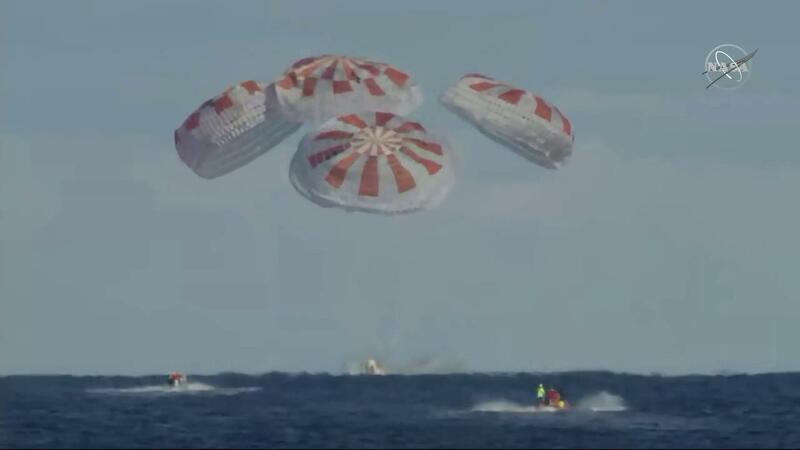 SpaceX’s Crew Dragon splashes down in the Atlantic Ocean after successful Demo-1 flight on March 8, 2019. At 2:32 a.m. EST, Crew Dragon undocked from the International Space Station to begin the final phase of its uncrewed Demo-1 flight test. The spacecraft is slowly maneuvering away from the orbital laboratory into an orbital track that will return it and its cargo safely to Earth. 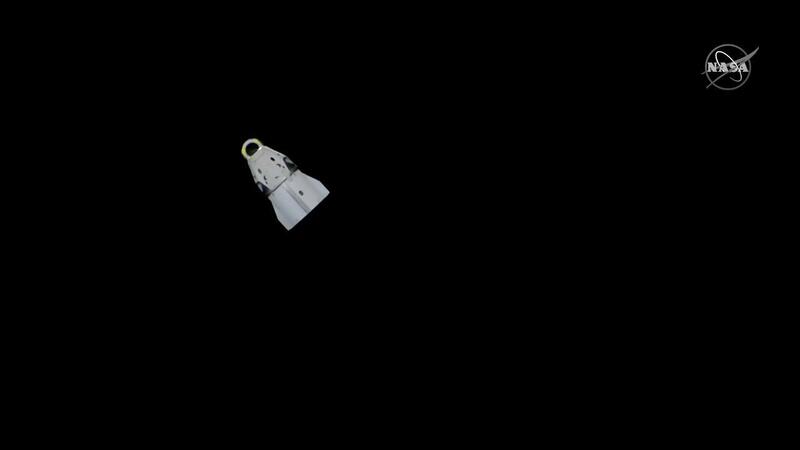 NASA will continue to provide live coverage until Crew Dragon is out of the immediate area of the station and will resume at 7:30 a.m. for the reentry, splashdown, and recovery. In about five hours, the Crew Dragon will separate from its trunk whose exterior contains a solar array that provided power to Dragon and a radiator to reject heat. Following separation, Crew Dragon’s thrusters will initiate the spacecraft’s deorbit burn at about 7:52 a.m. 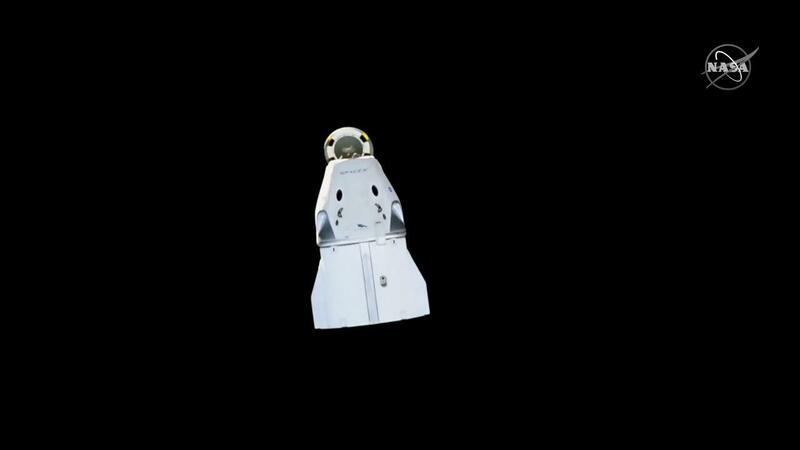 The 15-minute, 25-second burn will place the Crew Dragon on its final re-entry path into Earth’s atmosphere. The spacecraft is expected to splashdown in the Atlantic Ocean at about 8:45 a.m., its speed slowed by an enhanced parachute system in which drogue parachutes will deploy about four minutes before landing to unfurl four main chutes less than a minute later. After Crew Dragon lands in the Atlantic Ocean, SpaceX’s recovery ship will recover it and return it to Port Canaveral, Florida to conclude its mission. SpaceX’s inaugural mission with NASA’s Commercial Crew Program is an important end-to-end to test of the new system’s capabilities. More details about the mission and NASA’s commercial crew program can be found in the press kit onlineand by following the commercial crew blog, @commercial_crew and commercial crew on Facebook. 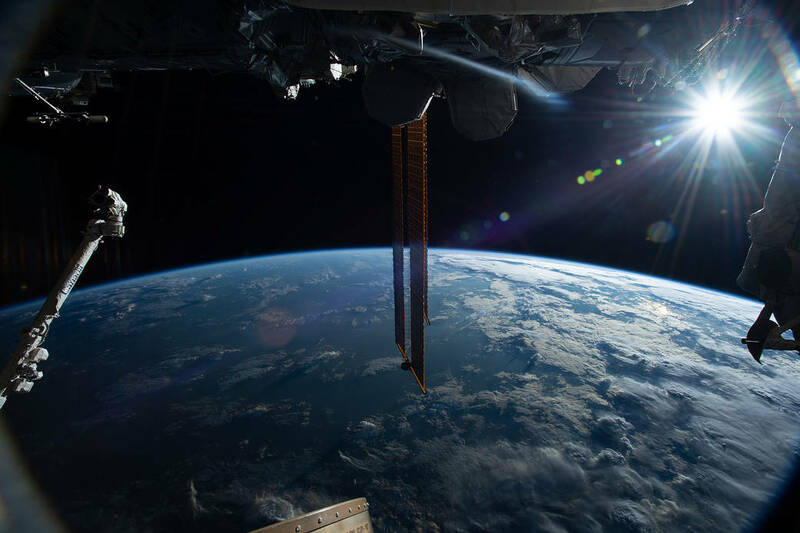 The uncrewed SpaceX Crew Dragon spacecraft is the first Commercial Crew vehicle to visit the International Space Station. Here it is pictured with its nose cone open revealing its docking mechanism while approaching the station’s Harmony module on March 3, 2019. 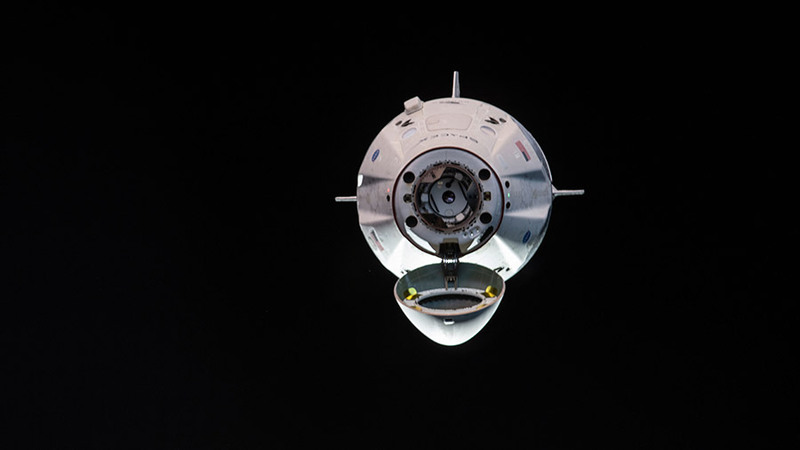 The SpaceX Crew Dragon’s hatch is closed and the stage is set for the Commercial Crew Program’s first undocking and return to Earth Friday. As NASA and SpaceX get ready for Friday’s splashdown, the Expedition 58 crew continued exploring a variety of space physics phenomena aboard the International Space Station. The uncrewed SpaceX DM-1 mission has one final milestone and that is the safe return to Earth with a splashdown in the Atlantic Ocean around 8:45 a.m. EST Friday. 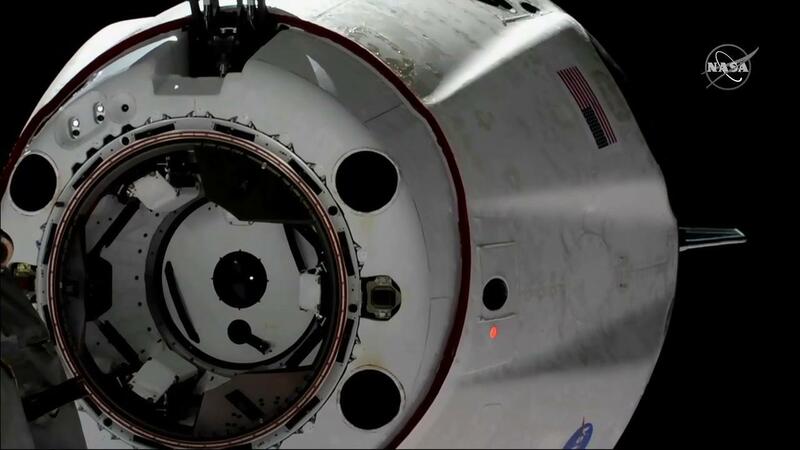 The Crew Dragon will undock Friday at 2:31 a.m. from the Harmony module’s international docking adapter. NASA TV will broadcast the departure and return activities live. The first commercial crew vehicle from SpaceX will be bringing back over 330 pounds of science gear, crew supplies and station hardware. It delivered almost 450 pounds of materials to resupply the station crew on March 3. Science took precedence as usual aboard the orbital lab today as SpaceX prepares to welcome its Crew Dragon back on Earth. NASA astronaut Anne McClain spent Thursday morning setting up hardware to explore ways to improve the production of higher-quality semiconductor crystals. Afterward, she relocated the Alpha Magnetic Spectrometer laptop computer that researches cosmic rays and antimatter from the Destiny lab module to the Columbus lab module. Commander Oleg Kononenko worked throughout the day on a Russian-European experiment researching plasma physics. The Plasma Krystal-4 study observes plasma crystal formation that could inform future research and spacecraft designs.